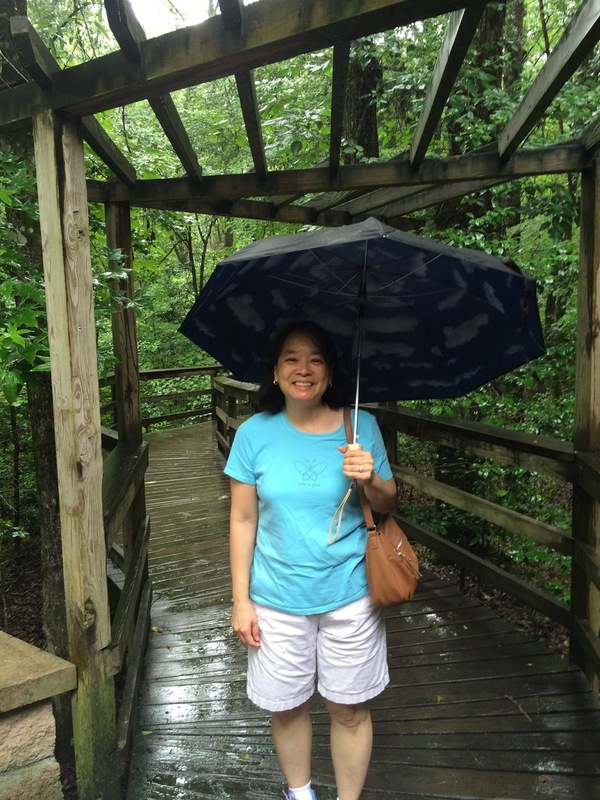 The inspiration to visit all 59 National Parks came during our visit to Congaree. It all started with getting the Passbook and the strange desire to collect stamps from all national parks. The day is dark and dreary. The rain is light but constant as we approached the park in mid-morning on a Monday. As we leave the relative hustle and bustle of Columbia, South Carolina, the traffic melted away and the trees became thicker. The air is musty and the crowd is — well, not there. The parking lot is nearly empty. The entrance is unassuming, just to the side of the road. What can we expect? Where are the people? The folks at Congaree will take pains to tell you Congaree is not a swamp, but a floodplain. 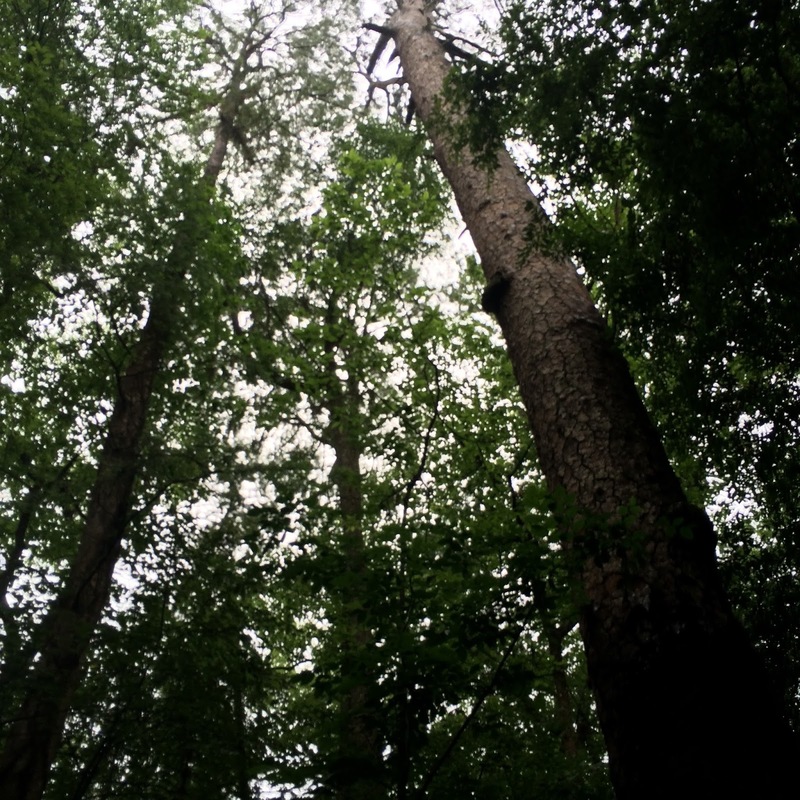 The predecessor to this National Park, created in 2003, was the Congaree Swamp National Monument. The word swamp conjures up tropical, bug infested wetness full of mud. A floodplain, on the other hand, conjures up water that comes and goes, lively and ever changing. 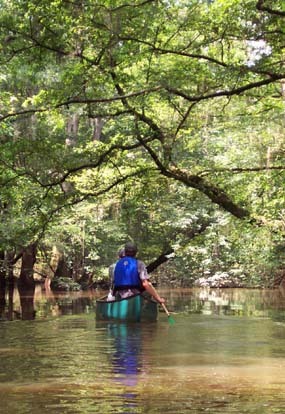 The Congaree and Cedar Creek rivers consistently flood the lowlands that make up the vast majority of the park. The flood water brings the nutrients that supports all kinds of life. The protected floodplain preserves the habitat so critical to many species. The majestic Loblolly pines soar hundreds of feet into the sky and provide a nice canopy for the vegetation and animals below. Rain is light but consistent on the lonely Monday in June we visited. The air is warm, but not hot, especially for June. 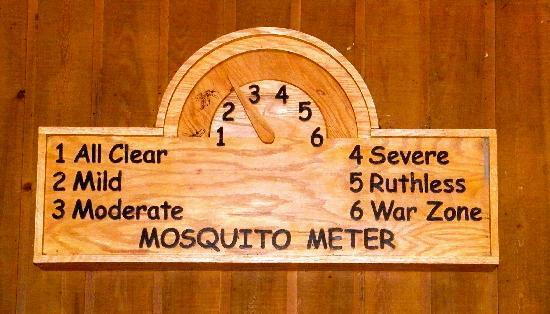 We knew we are in trouble when there is a “Mosquito Meter” as we walk into the visitor center. A mosquito meter!! We are fortunate. The meter showed only 2 on the scale. However, weather is our friend and our foe. The rain is certainly not ideal but the steady drizzle grounded most of the mosquitoes. The ranger tells us we are lucky for the meter to be at a “2” in June but warns us that if the rain stopped, watch out! 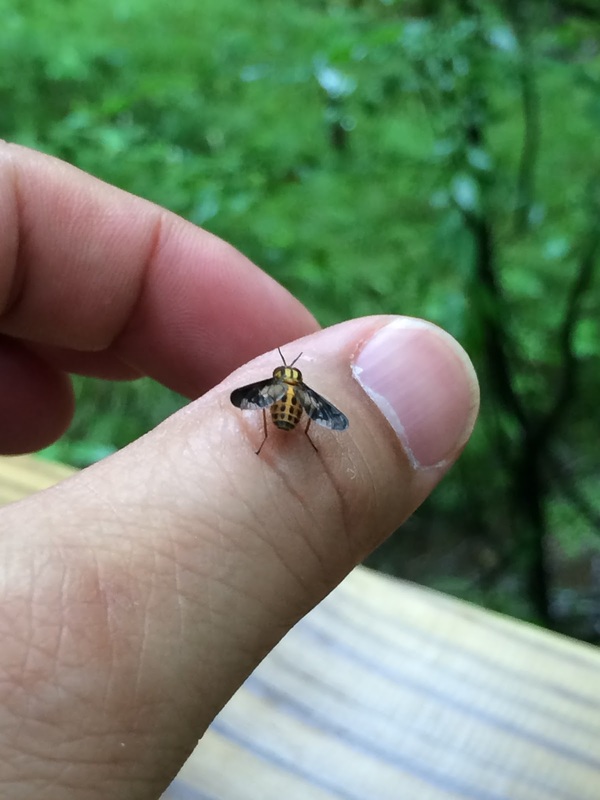 While we are not attacked by the mosquitoes, we were bothered by the really annoying deer flies. They keep buzzing our heads! We have to constantly swing our umbrellas and our hats to keep them from buzzing our ears. They do bite if you ignore them. These critters made it difficult to simply stop and admire the surroundings, to wait for the wildlife and to hear the birds. Evidence of water is everywhere as we walk along the elevated boardwalk. We are lucky that no part of the walk is flooded, as it is often the case. The markers for the self guided tour are clear and the material interesting to read. The walk itself is not that long and very flat. You are in the shade all the time — no worries about sunburn. Many benches along the way allow you to stop, observe, and listen to the forest of old growth trees. During this 2.4 mile walk, we cross paths with less than 10 other people. It is indeed serene and peaceful. The boardwalk is the highlight of this park. It’s easily accessible and tells an interesting story — if you can put up with the insects. It’s like taking a nature walk and requires no more exertion than to walk the 2.4 mile loop, One of the easiest trails in the national parks. There are certainly more trails, some of them take you right down to the river banks. Because of the steady rain, parts of these trails are flooded and at best, muddy. We decid to skip them but suspect it would be interesting to hike to the river. You can also take a canoe or kayak on the river itself. The rangers conduct guided tours during certain parts of the year. Camping is available and free, but very few take advantage of it. In 2015, less than 400 people camped. Change brings opportunities and threats, just like water invading a floodplain. Adapt, and thrive. Otherwise, perish. 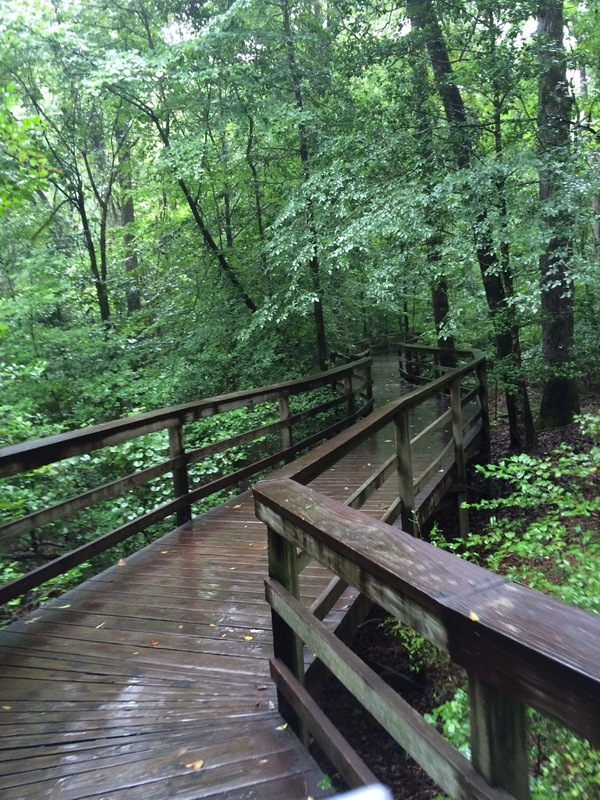 The Congaree is a small park by National Park standards. Like all National Parks, it has something special to offer. In this case, old growth forest in a floodplain. The Loblolly pines are majestic and the swamp (oops, I mean floodplain) is interesting. It’s not as majestic or awe inspiring as some of the other National Parks, but it has a certain charm to it. If you are used to seeing green forests, it’s not as impressive. If you are from the west and used to seeing brown hills and rock formations, the lush greenery is impressive. 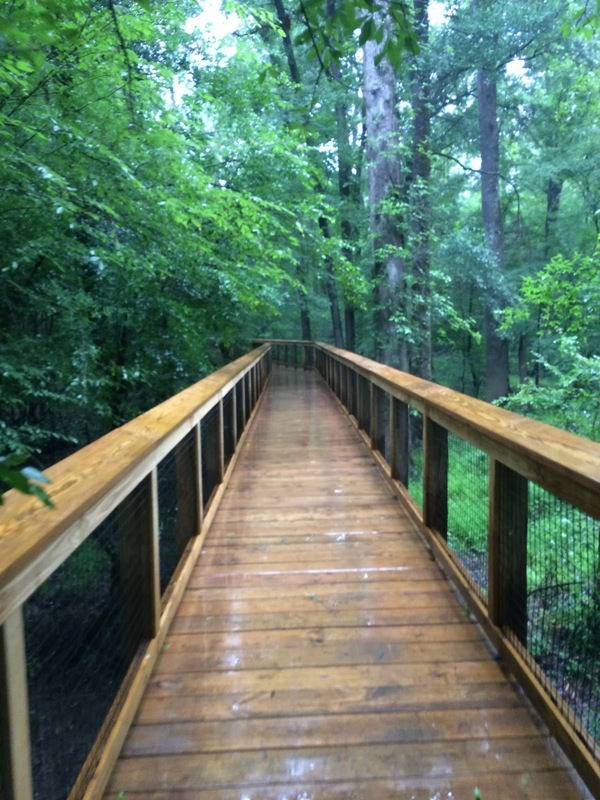 Have you visited the Congaree National Park? Leave a comment below on your experience. Click on the Follow link and get an email when new postings are available. I will not share your email so no worries. Check the National Park Service web site for conditions. Most of the park is in the floodplain and often flooded, sometimes for extended period of time. On average, it floods 10 times a year. If you only have a couple of hours, do the boardwalk loop. Don’t go during the summer. It’s hot, muggy, and full of insects that bite. There is no entrance fee or fee for camping. Go on a guided boat tour with the rangers. Check for schedule. If you can stand the insects, or if the weather is cool and insects are not a problem, sit quietly, observe and listen to the birds. Easy access from Columbia, South Carolina. About a 30 minute drive. Size: 26,546 acres, ranked 56th. Visitors: 143,843 visitors in 2016, ranked 50th. 2016 was a record year.